A fashion-conscious boater would be inclined to consider “the look” when planning her wardrobe for a river cruise. Severn locks are operated by a lock keeper some height above the lock chamber so one is unlikely to engage with grease-smeared paddle gear or rain-soaked gates. But Boatwif, concerned with comfort and safety, forsook jaunty styles and sleek deck shoes in favour of: thicker than usual trousers (to counteract cooler temperatures when cruising at speed), two thin layers (to allow for movement and insulation), the faithful boat boots, the longer of the two waterproofs (coverage over the upper thigh), a life-jacket and a choice of three hats (woolly pull-on, brimmed sunhat, peaked storm cap). Once on the river the water was calm and the deep water favoured Cleddau’s performance. 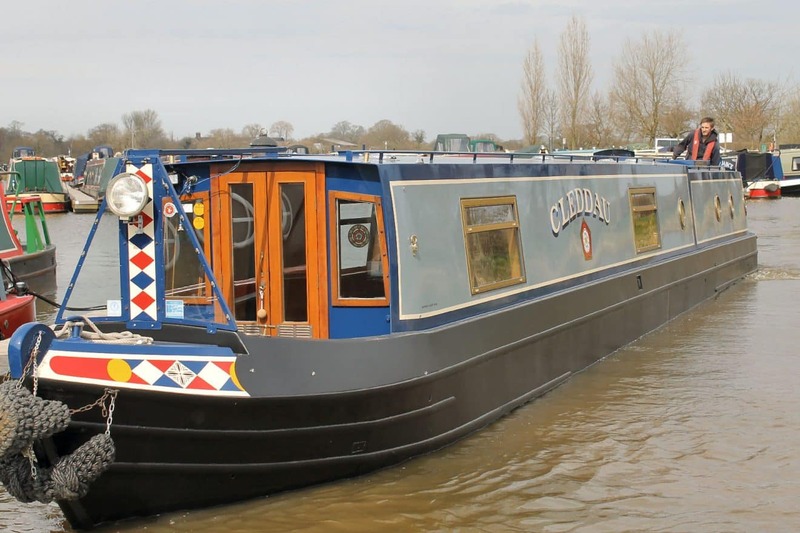 At each of the large double river locks (Lincomb, Holt and Bevere) we waited to be joined by the hire boat that had followed us down the narrow locks and in each lock we clung to our ropes in torrential showers. Views from the boat were dominated by green banks, fishing platforms and tall trees but the occasional residential properties utilised their positions with verandas, conservatories and moorings. A pair of half sunk boats (flooded?) indicated the force of water on this major river. In the distance, on the left bank going downstream, a row of what seemed like bright white street lights glistened. Closer we came – fine new lock landing stages became apparent. Oh that we were a month later! This is the entrance to the newly restored Droitwich Canals link, official opening due on the first of July! Then the outskirts of Worcester hove into view, large residences to the right, the racecourse and rowing clubs to the left. Beyond the hefty Worcester Road Bridge a graceful spire and the solid tower of Worcester Cathedral appeared. Entrance to Worcester, via Diglis Basin, requires some nifty boat handling from the upstream direction. Tucked discreetly into the bank is the lock: our turn was too early, the water flow gentler than anticipated. Neatly the Captain manoeuvred Cleddau backwards and towards a landing stage, there to deposit Boatwif. Above on the lock side a lock slave was engaged in a struggle with the winding gear. As the gates were opened her stress was apparent: where to re-board? down a steep ladder? out on the riverside? Her boat’s destination was upstream. Outside Cleddau and the hire boat hovered; Mrs Stress’s boat left the lock, turned downstream. The three boats twirled and whirled around each other, a graceful Dashing White Flotilla. In time boats drew into their destined places, Mrs Stress was collected – and Boatwif, solo, began to work the lock, two boats and seven persons below. Only slowly did some of the other crew realise that this was a DIY affair and some muscle was needed! Moored eventually alongside the Worcester and Birmingham Canal clothing levels could be adjusted. As for which headgear was worn? Why, the storm cap of course! In mid-afternoon Boatwif and the Captain strolled into the city. The towpath emerges just beside the Commandery. A hasty judgement, maybe on a new location, but this is an altogether smarter place. Two musical instrument shops and two bridal shops in the first few metres! 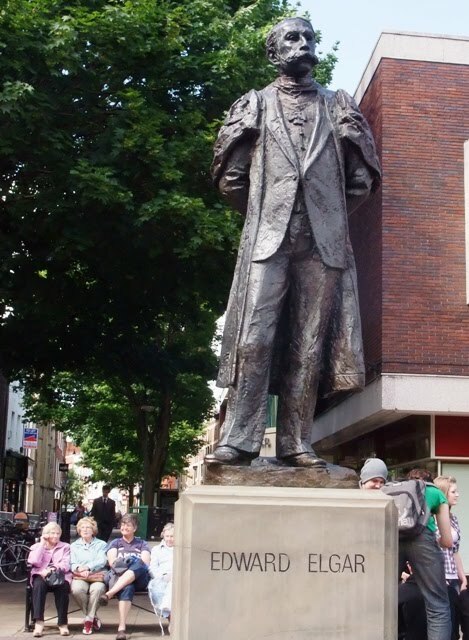 “Up towards the Cathedral, look out for the Elgar statue,” had been the instruction given by Penvro Pal, a school contemporary, who co-owns a Moroccan-themed restaurant. The Lounge identified we patrolled the city centre streets, the Captain purchasing bits to solve the radio aerial problem, Boatwif a mat to capture towpath mud… Then, last night, Penvro Pal talked us through our dinner, tapas and tagines, cheesecakes and mint tea, washed down by copious sangria. (see http://www.theloungeathodsons.co.uk/ ) Closing time came – and the Penvro Three adjourned to Cleddau for a late night inspection.